In New Orleans, Mardi Gras celebrations are the most colorful parties of the year. This is the last day before the traditional Catholic observance of Lent, when it’s customary to stop eating decadent foods until Easter. So everyone says good-bye to decadence by indulging in a GIANT party, where even the grown-ups get to act like kids. 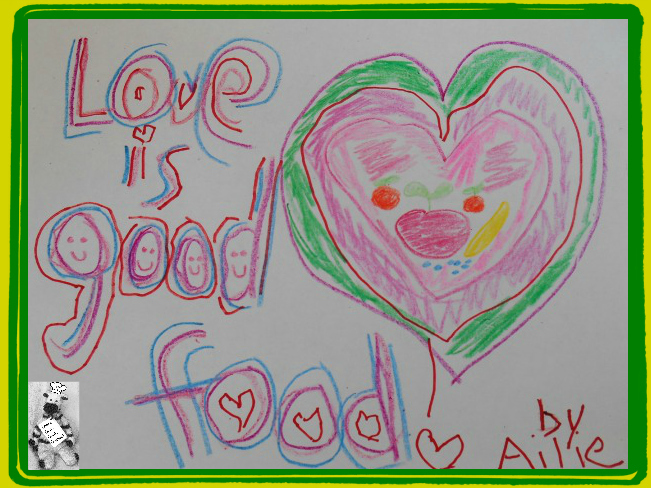 People dress up in costumes and go to parades and eat lots of super-yummy foods. To get some true insider info about Mardi Gras, I talked to my buddy Liz Williams, President and Director of the SoFAB (Southern Food & Beverage) Institute in New Orleans. Liz grew up in New Orleans, too, so she’s a total Mardi Gras expert! When I asked Liz why Mardi Gras is such a big deal for New Orleans kids and families, she gave me three great reasons. “Mardi Gras is a tradition, which is a perfect way to continue history and share a special experience with your family and friends. It’s a magical celebration that everyone can enjoy together, remembering old times and creating wonderful new memories. 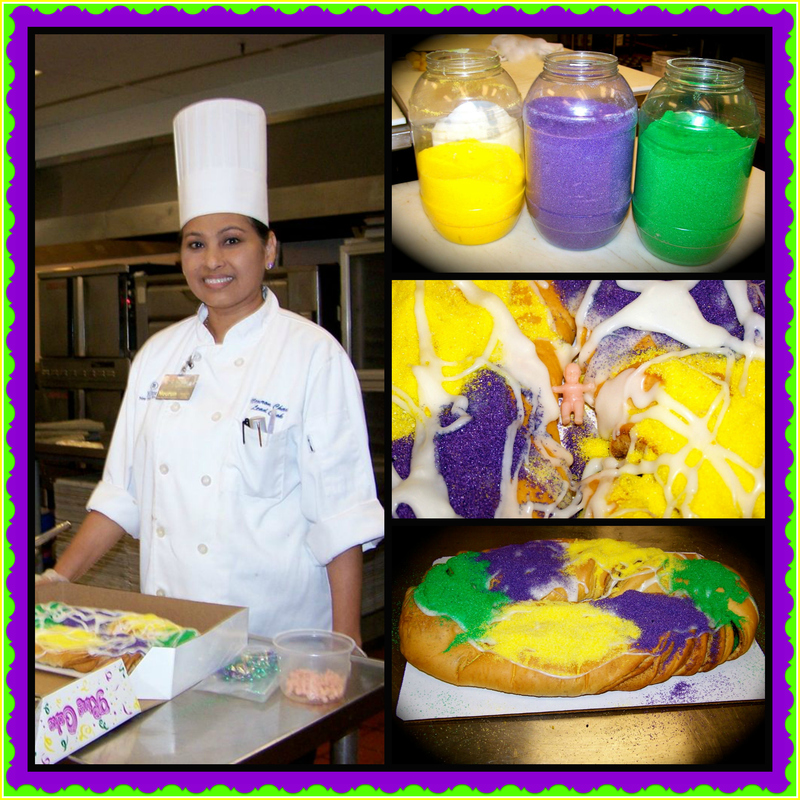 When I visited the New Orleans Hilton Riverside, their super-nice pastry chef invited me to watch how a pro decorates the traditional King Cake! 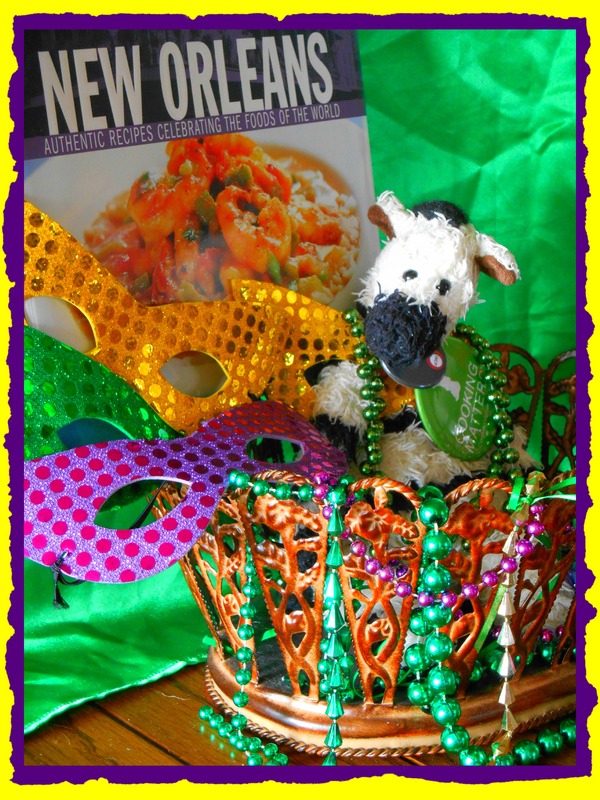 New Orleans is world-famous for its amazing food, so I figured there might be some fun edible traditions that go with Mardi Gras. And hurray: I was right! At this point I wondered: “Is a King Cake something kings eat? Or is it something that makes you a king when you eat it?” It turns out that both of these are sort of true. 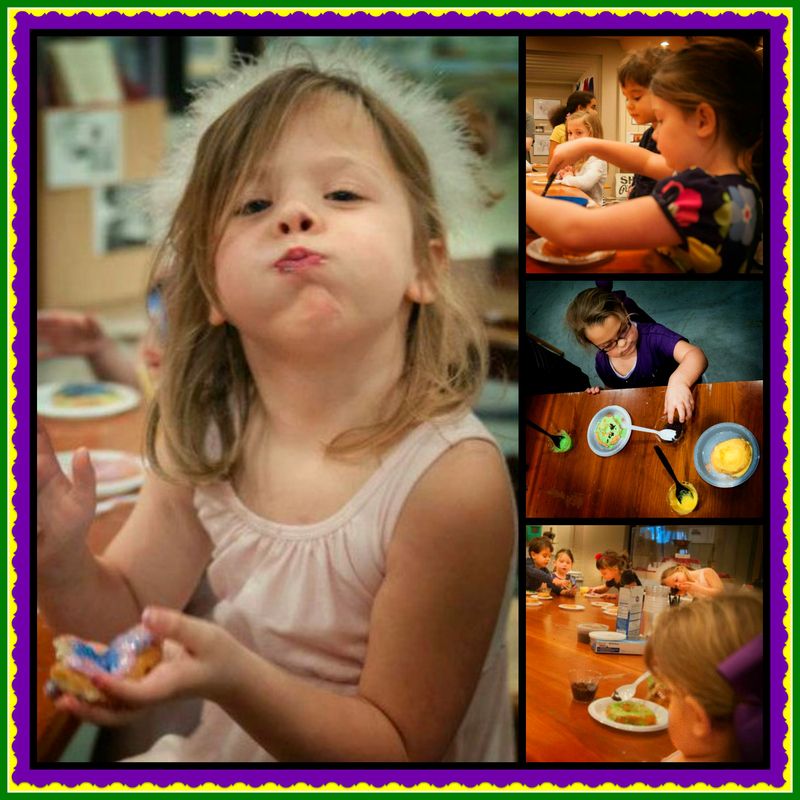 The kids at SoFAB had tons of fun making King Cakes from doughnuts! King Cakes aren’t actually cakes, but more like Danish pastries in festive masquerade (perfect for Mardi Gras). They’re decorated with a sugar topping in classic Mardi Gras colors—and the secret ingredient of every cake is the prize hidden inside. It started out as a humble coin, dried bean or pea. In the late 1800s, wealthy Louisiana landowners were known to use precious jewels. By the mid 20th century, the typical King Cake prize became a small porcelain or plastic baby. One thing has stayed the same over the centuries: whoever gets the prize in his or her slice of cake is crowned king (or queen) for a day. The lucky winner is granted the gift of good fortune – and has the honor of providing a cake for their friends and family to enjoy at the next Mardi Gras celebration. Well, colorful treats with prizes sounded really good to me. But I couldn’t help wondering: is that ALL people eat during Mardi Gras? 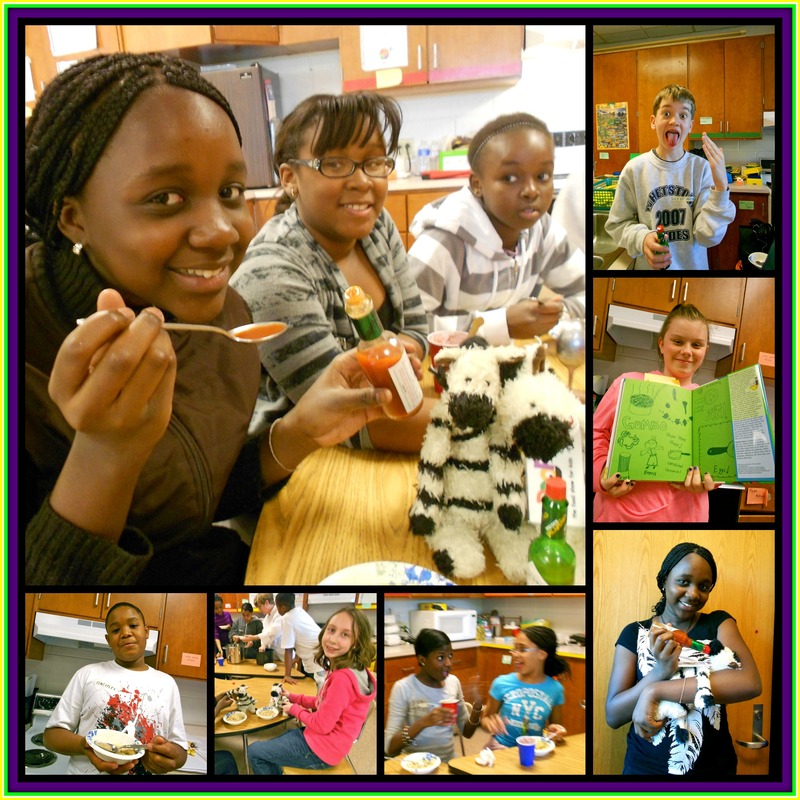 Kids and zebras LOVE gumbo — my cousin ZakBot and I had a great time learning to make it with the Young Chefs after-school cooking club! I asked Liz how she and her family celebrated Mardi Gras when she was a kid. “My family always went to parades at Mardi Gras. On Mardi Gras day, we would dress in costumes and walk around and see people we knew. 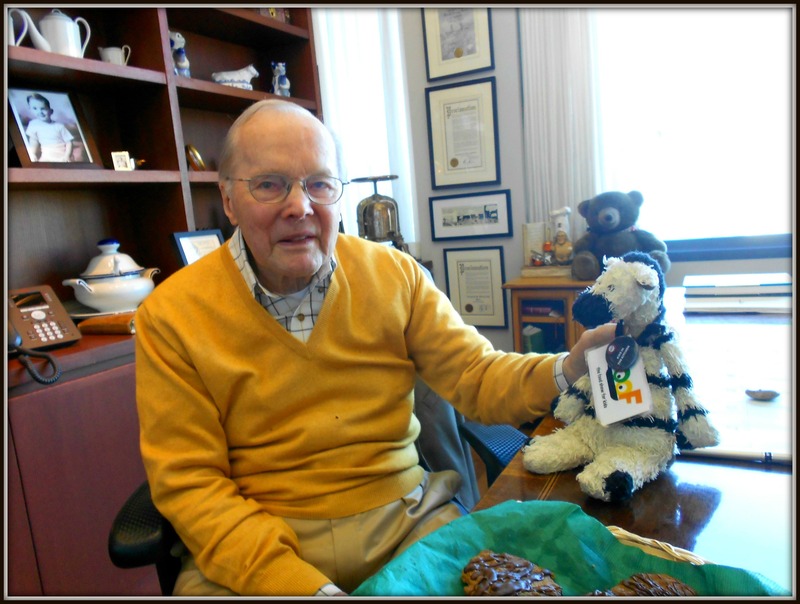 Later, I did this with my own children—and now, with my granddaughter Olivia. 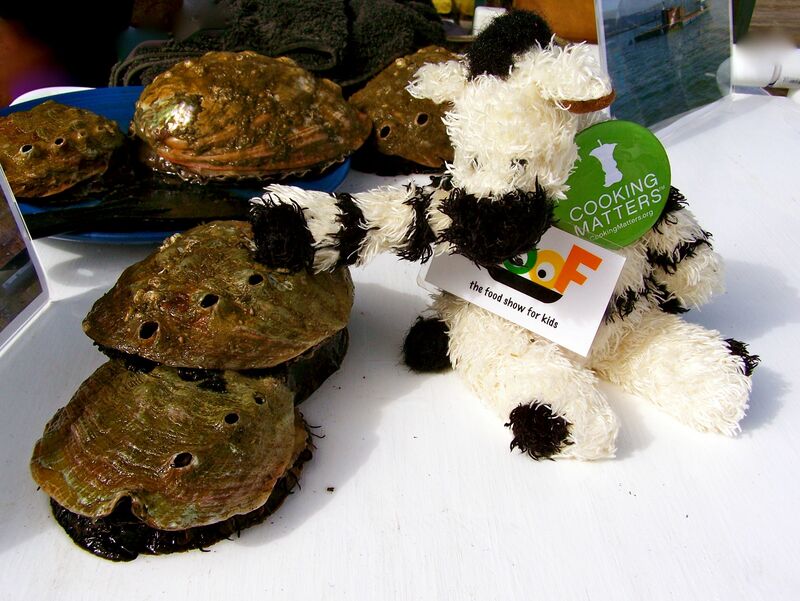 Say hello to a Zulu Coconut — courtesy of SoFAB! It turns out that Mardi Gras beads are another super-fun part of the celebration. During the parades, the Mardi Gras krewes (which are special clubs) toss colorful strings of beads off the floats for people to catch. There are lots of other cool trinkets, too! For decades, the most famous prizes of all were the Zulu coconuts from the Zulu Social Aid & Pleasure Club. These days, there are so many people at the parades that tossing coconuts can get kind of dangerous, so this isn’t done any more. But lots of grown-ups have fond memories of catching them! If you’re like me, you might be thinking: well, this sounds like a blast! But I don’t live in New Orleans—is there a way to celebrate Mardi Gras at home? 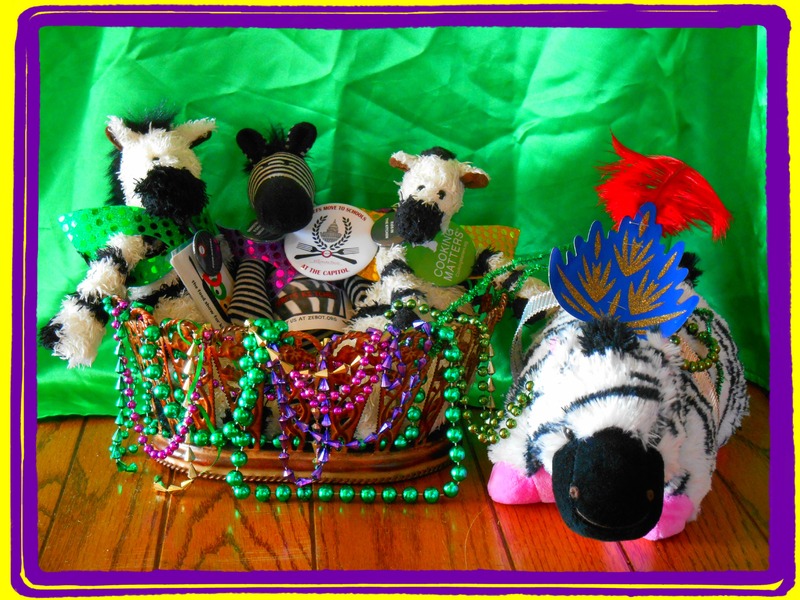 My zebra buddies & I followed Liz’s advice and made our own Mardi Gras parade float! “Of course!” Liz said. 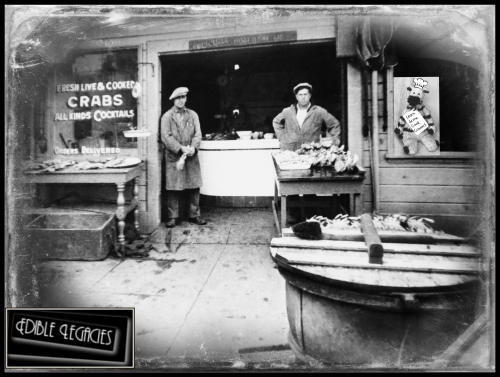 “Eating New Orleans food is a great way to celebrate–especially King Cake. 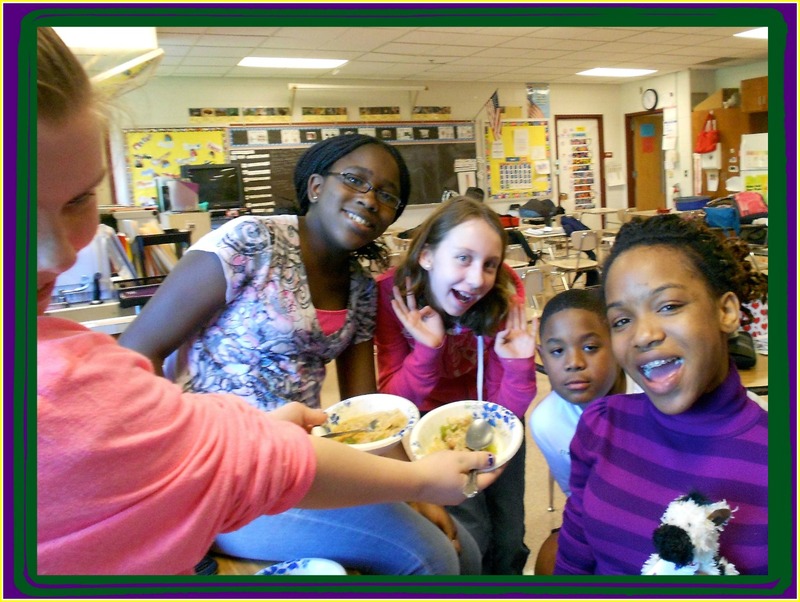 You can look through cookbooks or browse the web to find fun, kid-friendly recipes. 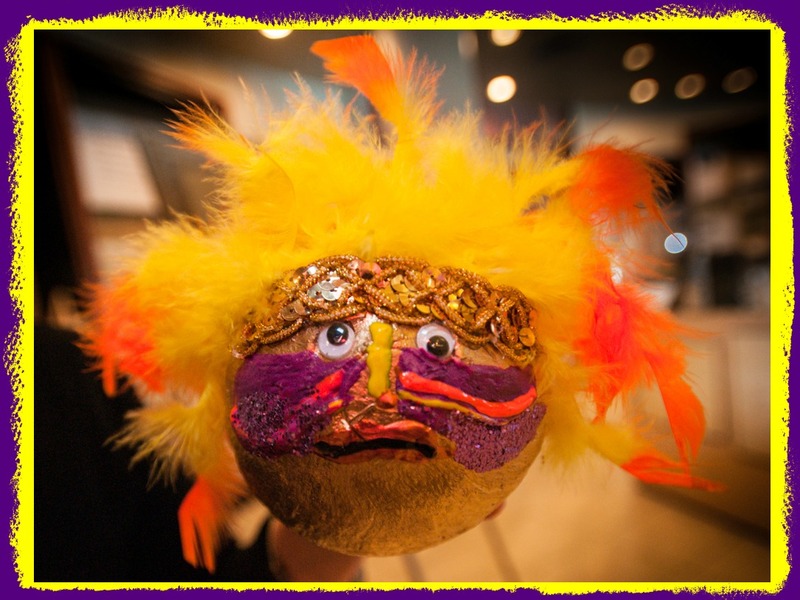 Are you ready for ZePerfect Mardi Gras celebration? 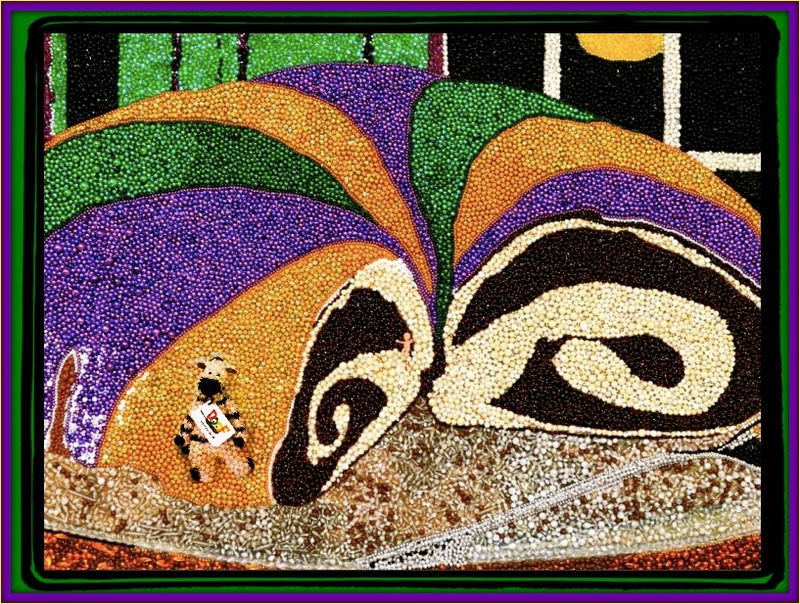 Then put on your costume, have a parade, try this super-festive King Cake recipe – and share the fun with your family and friends. This beaded cake was crafted by the students at Rudolph Matas Elementary School with visiting artist Stephan Wanger and Arts Facilitator Tama Distler. If you want to try making your own King Cake, Liz Williams says there are lots of good recipes on the web. If you’re looking for a super-fun and very easy way to bring home a taste of New Orleans, you can make pretend King Cakes, just like the kids at SoFAB did in their Mardi Gras class. 1. Drizzle the doughnut with your glaze (you probably won’t need to use it all). 2. Decorate your doughnut with purple, green and gold sugars (or use sprinkles, candies and anything else you like). 3. Put your baby or jelly bean in the center. 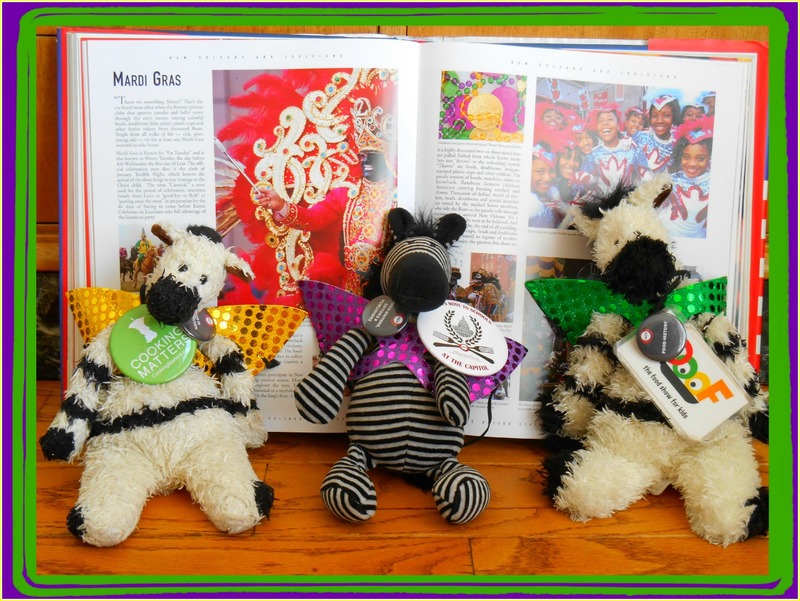 Want to learn even more about Mardi Gras? Watch this cool video from National Geographic Kids! 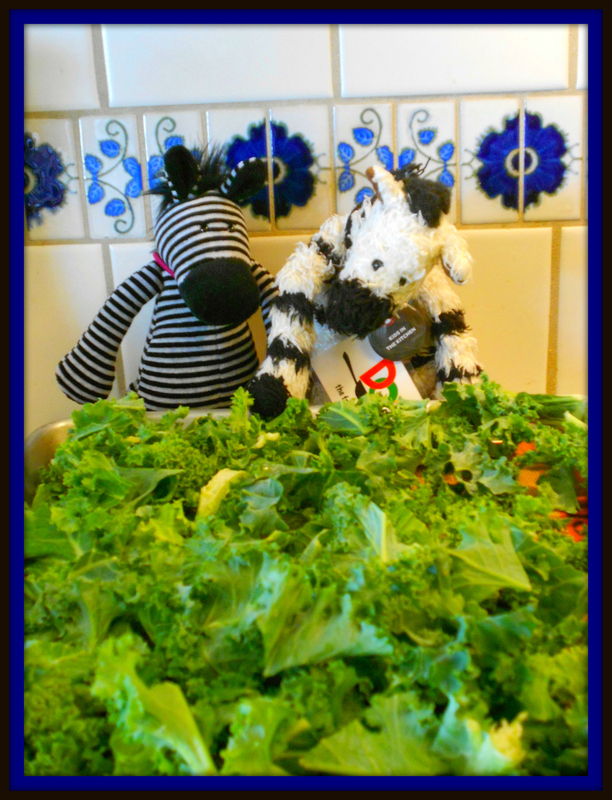 Posted on February 1, 2018 by ZeBot Zebra	• This entry was posted in ZeAdventures, ZeInterviews, ZeRecipes, ZeVideos and tagged adventure, cooking with kids, culinary history, DIY, easy, food traditions, fun, gumbo, healthy, Iko Iko, kids' cooking, King Cake, Liz Williams, Mardi Gras, New Orleans, recipe, SoFAB, video, ZeBot, zebras. Bookmark the permalink. ZeBot, let’s celebrate Mardi Gras in New Orleans next year! Oh, let’s! 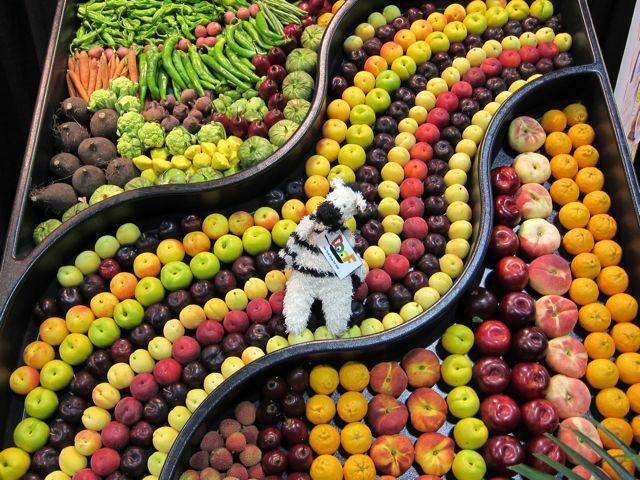 I’ve got a great zebra costume — and now that I know how to make King Cake and gumbo, I’m all ready to let ZeGood times roll in NOLA!! !